The landing page is the front page of the site, where the customer can get a good look at everything the site has to offer. Therefore, it includes an attractive header, some featured products, call-to-action buttons and various news and social media integrations. 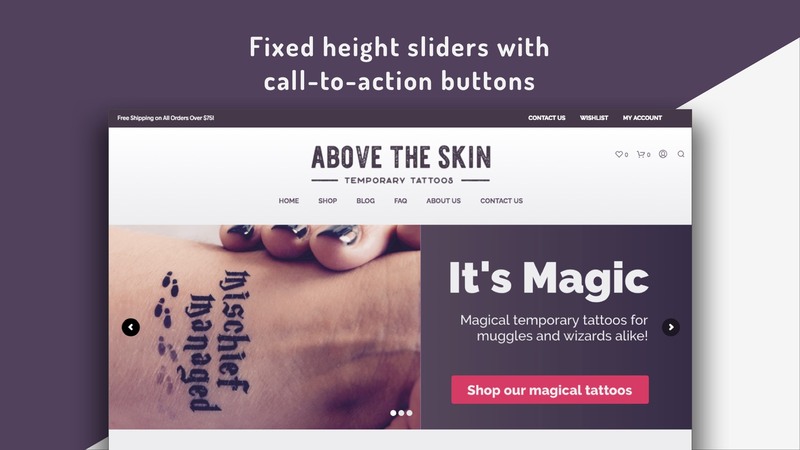 The header of the landing page features fixed height sliders with call-to-action buttons, in order to showcase products and make it easy for customers to jump to a particular section. The landing page show a selection of featured products that can be changed very easily. All products are demonstrated in nice card views that animate when the cursor hovers on top. Underneath, the description, price, favorite and an “add to basket” prompt are displayed for the customers convenience. Here the customer can see all (or some) of the product categories offered by the eShop, laid out as card views with nice focus animations on hover. Clicking or tapping on a category leads the customer to the appropriate shop section that displays the products of that particular category. It is common to use banners to attract customer attention to certain elements of the business. 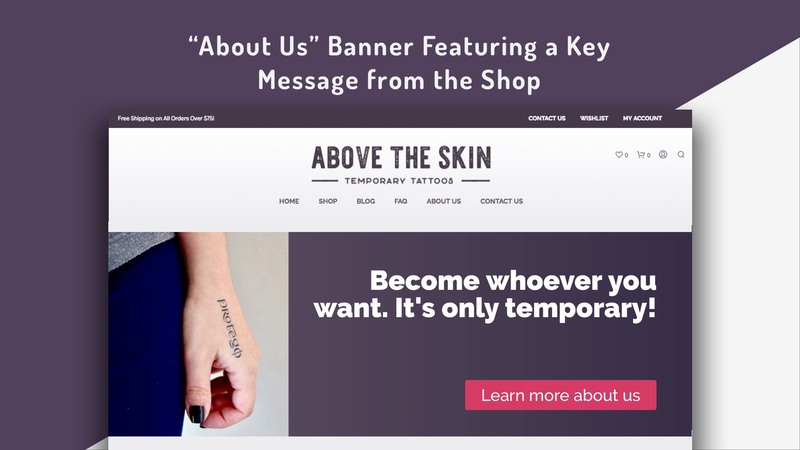 Here we used a banner to display Above The Skin’s moto and prompt the visitor to learn more about the business by clicking on the button. Generating new and original content is important for ranking high in search engines and every eShop should try to attract views by making interesting posts in blogs and social media. 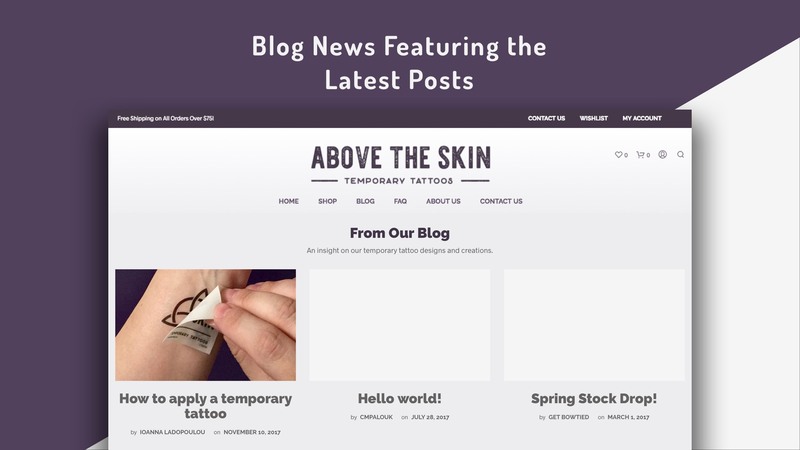 Here, some of the latest blog posts for Above The Skin are displayed in a carousel fashion with autoscrolling. Alternatively, the blog news section can be customized to feature only selected blog posts. 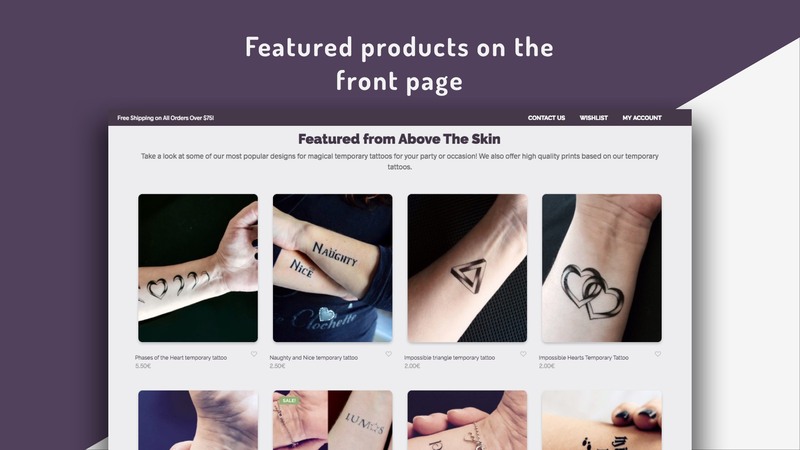 Above The Skin uses Instagram as their favorite social media outlet and we incorporated their latest posts here. 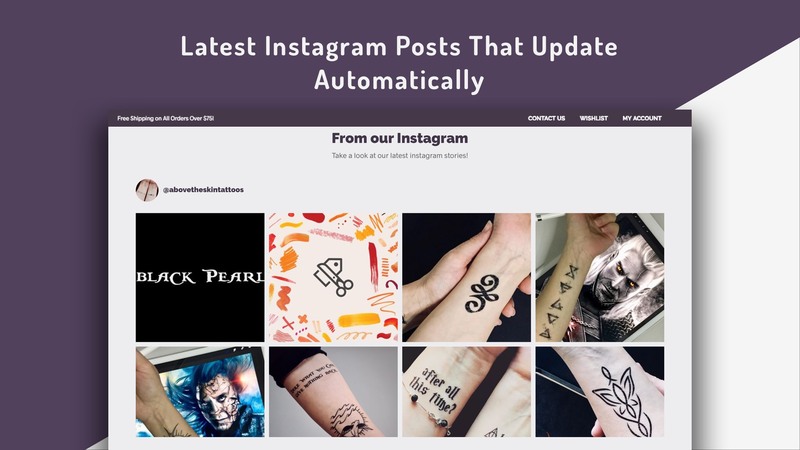 This section is automatically updated whenever Above The Skin posts something new on Instagram. The visitors can see the latest posts and follow them easily. The shop page features a grid of four products per line that can be sorted by price, popularity or other factors. The displayed products can also be refined by price, category. Furthermore, the visitor can search for any product they seek without having to navigate to it. The product view shows all the available pictures of the product along with a short description right beside it. The customer can add it to their basket or favorite it for later reference. Also, there are share buttons at the side for easy sharing to facebook, twitter and Pinterest. Further down the page there is a detailed description of the product along with any other available details like technical specifications and customer reviews. Finally at the end of the page the site displays a “you may also like” section with any products that may interest the customer based on the current product and is preconfigured by the seller. 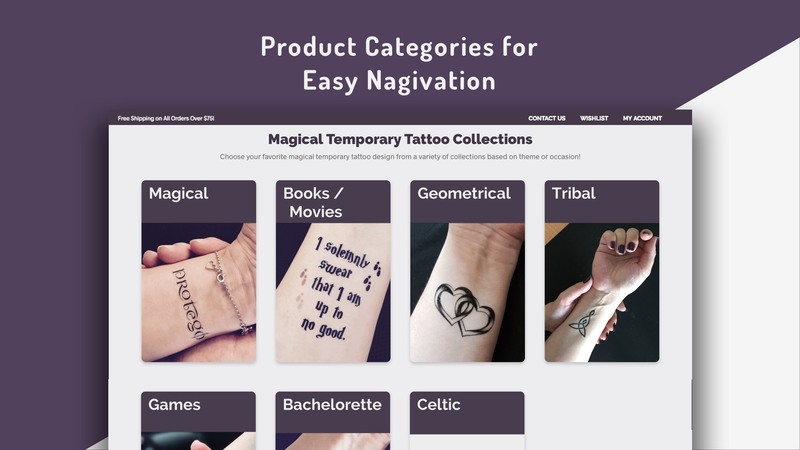 After that there is a “related products” section that displays some more related product that are automatically selected. Above The Skin is based on Greece but ships globally, therefore tax and shipping expenses are configured appropriately for each location. Above The Skin supports PayPal as its main payment method. From a server standpoint, all our sites are built using the latest PHP version 7.2, with opcache enabled for script caching and served by nginx for faster response times. The site is built using WordPress, always updated to the latest version for security and performance reasons. From a WordPress perspective, we use WP-rocket, a few other plugins and custom code to cache each page and optimize size and speed and make the site easier more enjoyable for the end user. With these optimizations Above The Skin has a page generation time of less than half a second and total load time for the landing page of less than 3 seconds. Would you like a similar eCommerce site? Please have a look at our prices and get in touch to discuss it!